Don’t accept that bolting wastes are just a cost of doing business. The Lean Bolting Evaluation analyzes your current bolting practices and provides personalized suggestions to improve your processes. Please fill out the information below to discover your path to World Class Bolting. Lean Bolting means less waste. 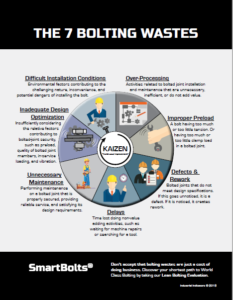 Our evaluation focuses on reducing these 7 Bolting Wastes. 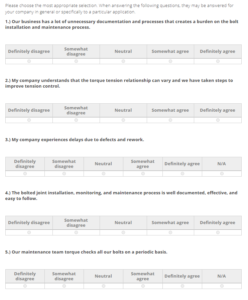 Complete the Lean Bolting Evaluation. It should take you less than 10 minutes. 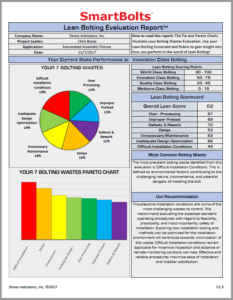 We provide a personalized Lean Bolting Evaluation Report with suggestions to improve your bolting practices. If you are considering a particular application, please fill in below a name to describe it. Providing an application name will improve our evaluation of your submission. Or, you may skip and proceed to the next step. Please choose the most appropriate selection. When answering the following questions, they may be answered for your company in general or specifically to a particular application. 1.) Our business has a lot of unnecessary documentation and processes that creates a burden on the bolt installation and maintenance process. 2.) My company understands that the torque tension relationship can vary and we have taken steps to improve tension control. 3.) My company experiences delays due to defects and rework. 4.) The bolted joint installation, monitoring, and maintenance process is well documented, effective, and easy to follow. 5.) Our maintenance team torque checks all our bolts on a periodic basis. 6.) Our fastener coating has been selected specifically for corrosion protection in the environment that it will be used in. 7.) Many of the bolted joints I am involved with are in hazardous locations that make safety of installation and inspection very important. 8.) Our company has taken steps to simplify and streamline our bolted joint related activities. 9.) We use load indicating products to control proper preload. 10.) Our production line is capable of identifying defective bolted joints. Please choose the most appropriate selection. 11.) The proper tools needed to service the bolted joint are always available when we need them. 12.) Most of our bolted joint maintenance occurs once a machine has already malfunctioned and is out of service. 13.) Our engineering team understands the proper amount of preload needed for adequate bolted joint security. 15.) Our annual inspection process runs smoothly because I am able to easily monitor bolt preload and document any necessary maintenance. 16.) What amount of certainty do you have of proper bolt tension after installation? 17.) The installation process has error proofing “Poka-Yoke” strategies to reduce defects. 18.) Our business has not experienced a major equipment breakdown or failure since being put into service. 19.) Our maintenance department never needs to maintain or repair our machines and equipment because of a preventable bolted joint failure. 20.) Important considerations like proper preload, sufficient tensile strength, hydrogen embrittlement risk, corrosion protection, installation tool access, and environmental temperatures are considered each time we design a new bolted joint. 21.) Our bolted joint installation process and environment has been evaluated and improved for safety, effectiveness, and efficiency. Almost Complete! Please select a preferred day and time you would like to discuss your Lean Bolting Report results. Select a time. Time is in ET (New York Eastern Time). No thanks, I prefer to receive my report without feedback. We look forward to assisting you on your path to Leaner Bolting! Add my email to the SmartBolts newsletter list.